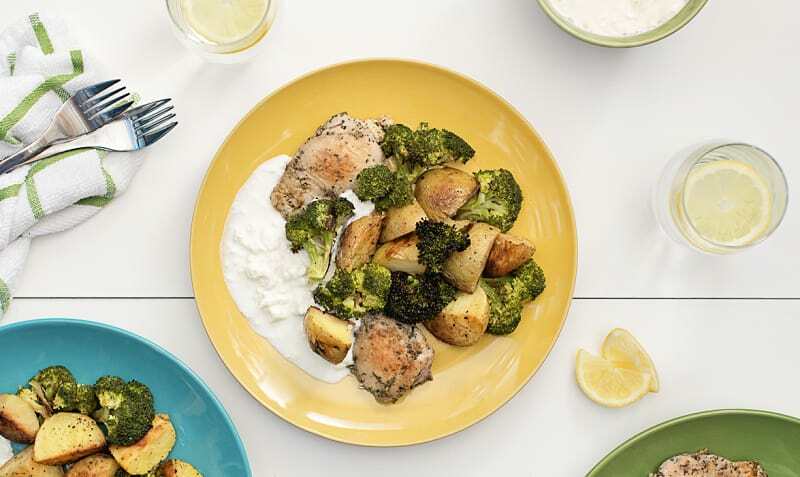 Deliciously seasoned chicken thighs pair beautifully with lemony roasted potatoes and broccoli and a creamy yogurt-feta sauce in this Greek-inspired dish. Best prepared within two days of delivery. Preheat your oven to 450°F. Wash and dry the broccoli and potatoes. Cut the broccoli into florets. Cut the potatoes in half lengthwise. Pat the chicken thighs dry with paper towels and put them in a large bowl with the Be Fresh Greek seasoning. Toss well until chicken is coated evenly. Wash hands after handling chicken. 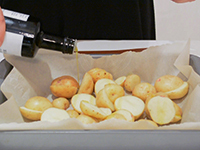 Line a sheet pan with parchment paper, wax paper, or silicon baking mat, and place potatoes on it. Drizzle with olive oil, season with salt and pepper to taste, and toss thoroughly to coat. Arrange potatoes cut side down. Roast for about 20-23 minutes, or until browned and tender. Line a second sheet pan. Place broccoli on the pan, drizzle with olive oil, and sprinkle with salt and pepper to taste. 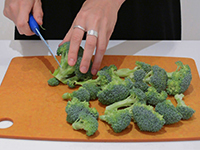 Toss broccoli until it is coated with oil, and arrange in an even layer, cut sides down. Roast for about 12 - 15 min, or until browned and tender. Since they don’t take as long as the potatoes, make sure to start them about 10 minutes later. Crumble the feta. Combine yogurt, ½ the cheese, and the juice of half the lemon in a small mixing bowl. Drizzle a little olive oil in, and season with salt and pepper to taste. Mix well. 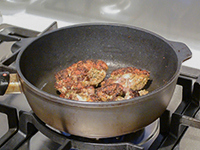 In a large non-stick pan, heat 1 tbsp olive oil over medium-high heat until hot. Add chicken into the pan, making sure no pieces are touching, and cook for about 5-7 min per side, or until browned and cooked through (cut it open to check if you are not sure). Transfer cooked chicken to a plate. 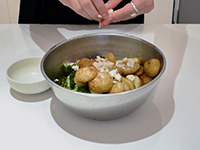 In a large mixing bowl, combine the roasted broccoli, roasted potatoes, the second half of the crumbled feta cheese, the juice of the second half of the lemon, about ½ tbsp of olive oil, and salt and pepper to taste. Toss thoroughly to combine. Divide the dressed veggies and the cooked chicken among four plates. Dress the chicken with the feta yogurt sauce, and serve!